Yum! Our first real “plant based” dinner was a success. 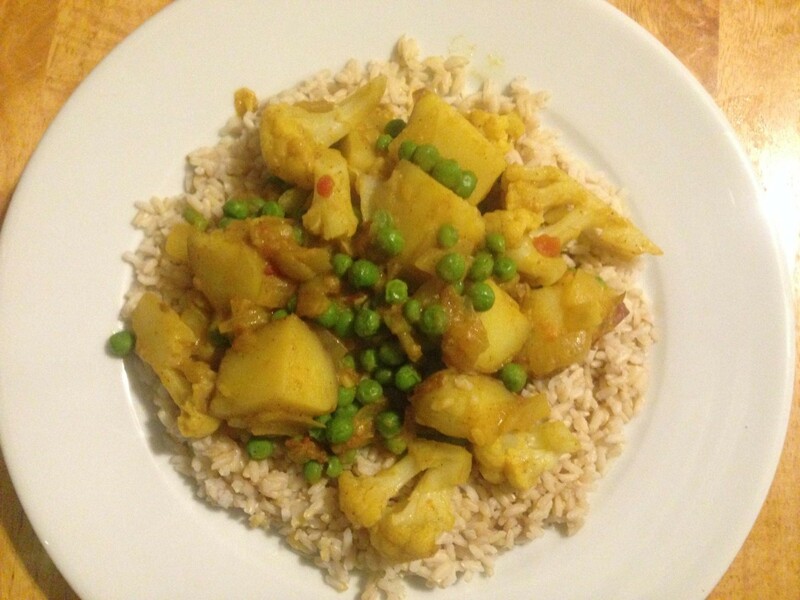 Last night we had potato curry and it was delish! I had to share the recipe. This worked well for me in a large, deep skillet. Start by sauteing the onion and garlic in the vegetable broth over medium heat. Throw in your potatoes and curry and stir for about 4-5 minutes. Add tomatoes and coconut milk. Stir, reduce heat. Cover the pan and cook for 15 minutes, or until potatoes are cooked, stirring occasionally. After potatoes are soft, add your frozen peas and cauliflower. Stir until thawed. I also suggest doing a taste test right about here to see if you would like more curry. Once all vegetables are cooked, remove from heat. I served ours over brown rice with a splash of coconut aminos on top. Oh so good! So, I know I just commented, but I have to say this looks delicious and I have just about all those ingredients in my house and plan on making this very soon! Woo hoo! Tell me how it turns out. 🙂 I tweaked the amount of curry and coconut aminos I used to get the flavoring just right. I personally like a lot of spice to mine. I ended up making this and it was delicious! I added kale and lentils, used sweet potatoes and slightly reduced the amount of curry but all in all this was so good and I can see it becoming a staple. So glad you made it work for you! Sweet potatoes and lentils in it sound delicious!